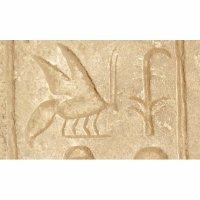 Engraved limestone gate unearthed in Karnak temple complex on Luxor’s east bank bears name of King Ahmose’s previously unknown great-grandfather. During routine excavations on the northern side of the Amun-Re Temple in Luxor’s famous Karnak temple complex, a team from the French-Egyptian Centre for the Study of the Karnak Temples this week unearthed a gate that they say has led to a significant breakthrough in archaeologists’ understanding of Egypt’s enigmatic 17th Dynasty. It was this dynasty that launched the military campaign that eventually succeeded in ridding Egypt of the tribe of invaders known as the Hyksos.